Stuff Points: Earn 30 points when you buy this stuff. A money saving mop combo. Save yourself some cash when you buy these popular products together. This Deluxe Mop set includes a full mop with the pad, but it also comes with a four pack of additional pads in varying types, and a cleaning cloth with the same chemical-free cleaning power. Get one 1 Household Microfiber Swivel Mop, 1 18" multipurpose pad, our multi-surface 18" mop pad 4-pack and a single microfiber miracle cloth. With the power of microfiber, you will be able to clean your floors faster and easier, and you will be able to do it without using harsh chemicals or wasting a bunch of energy. The swivel head on this mop allows you to easily maneuver anywhere, so cleaning any hard floor will take less time and cause less frustration. Handle Length 34" - 60"
Pad Dimensions (l x w) 18" x 5"
Head Dimensions 15.25" x 4"
Household Microfiber Swivel Mop - A good quality mop for regular house cleaning. A quick and simple way to clean any hard floor. There are no chemicals or soaps necessary, and the pads can be reused hundreds of times before needing to be replaced. Dimensions (l x w) 18" x 5"
Multi-Surface Mop Pad 4-Pack - Get one multi-purpose pad, one dry dusting pad, one chenille pad and one scrubbing pad. Prepare yourself for cleaning any mess on any floor of your home. Machine washable hundreds of times. Shipping Weight .1 - 1 lbs. awesome mop! great price and very sturdy but lightweight and the mop pad that I use is the best that I have ever had It swivels great also! Love this mop! Years ago I bought this set at a flea market booth in Florida. I have had it for at least 12 years but the velcro didn't stick anymore to the mop so I ordered another one. Same thing. I love it. Now I have twice the pads because I can still use the old pads now too. Our new home has gorgeous hardwood floors. This mop set is perfect to clean the whole house. Makes the job easy. The mop is very sturdy and light and the various mop heads are wonderful for wet and dry cleaning. A great product at a good price. 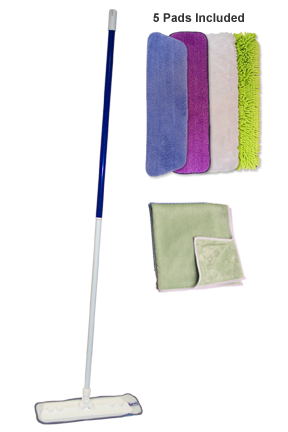 I've ordered many of these mops over the past 6 years, for my cleaning business, other customers, and for personal use. It works better than any others I've tried, including my $100 mop from a competitor. Upon receiving this Mop, it was nice and great quality, however the handle that came with the mop was not a good handle....oops it happens!! I received a faulty handle or pole I guess you could call it, but!!! the company replaced it appropriately and immediately!! and was very nice about it! Highly recommend this mop, it works great and easy to change the mop heads and wash them! Thanks to: Simply Good Stuff! I have had many microfiber mop sets in the past and like they have increased the microfiber pad size. However, I have used the mop a few times and there is a crack in the plastic where pole meets to extend it. The pole still tightens nicely. This is the best mop set I have purchased and the quality of the mop pads are awesome. Great set. Great price. Just today I used the various pads and adjustable pole to dust the walls and ceiling, sweep up the floor and do a damp wipe down of the floors. Fast cleaning with microfiber. Love it. Love it. Wonderful mop for the price. Great value. This is one of the best mops I have ever used. I have operated my own housekeeping businesses for more than 9 years and I have a variety of floor surfaces to clean. The green mop head is my favorite for most jobs but each mop head has it's own purpose. I have a twist mop that I use often as well but there are times when I need the speed and ease of this mop because it covers a lot of floor space quickly. It's fantastic for wood and laminate floors too. Actually, this mop is great for any type of floor surface when you use the right mop head for the job. There are many imitations out there in stores but not one of them is as good as this one. This mop is sturdy and much tougher than the knock offs that you can buy in the store. I love this mop and I highly recommend it. I am a bit disappointed with the mop. I have tried it a few times and I still can see that there is a dirt line and some grunge. I scrubbed the floors with orange soup before I put down the throw rugs, and it is still far cleaner from when I scrubbed with the orange soap which you can see from where the throw rugs were placed. I used vinegar and hot water as instructed. It's not awful, it's just not great. can I CLEAN GLASS WITH CLOTHS IRECEIVED? Yes, Absolutely. They are perfect for windows and mirrors. Yes. The head has Velcro on it, and the pads have a backing that allows them to stick. 18" describes the pad size. Be sure to check the specs for actual dimensions on the head. It's a pretty standard size. Seems like it would be too big to get in that small (tight) of an area. I have been using the MicroFiber Swivel Mop by Ontel, it fits perfect for this job. I'm afraid your size will be too big to fit! You can easily clean behind toilets and get into other tight places with this mop. If you were happy with the performance of the mop you mentioned, you'll be blown away at how well this one works. Specially Designed Microfiber Pad For Dust Mopping. Great For Hardwood Floors! Super Long, Aluminum Pole. Nothing Will Be Out of Your Reach! A Powerful Cleaner For Super Dirty Hands. Biodegradable & Easy On Your Skin. Self Wringing Mop With Advanced Microfiber Head And Integrated Scrubber. Replaces Up To 286 Rolls Of Traditional Paper Towels. Reuse Each Sheet 100 Times! Buy more and save! This extra large container is perfect for professional cleaners and institutions.